It’s Hayes’ show, as he appeals to the audience, constantly addressing us, and we throw our support behind him. Instead of making Chuck a twerp, Hayes turns him into a truly likeable guy, smiling through all his misfortunes, recognizing the ridiculous humor of his bad luck. But it’s not his pursuit of the corporate high life that we’re rooting for; it’s his potential relationship with Fran, the girl of his dreams. It’s important for Hayes to convey that he’s more than just an unfortunate chump, but that that romance and desire lives in him. For me, Hayes’ highlighting moment is the ridiculously sweet song “She Likes Basketball,” in which he realizes that his hopes of romancing Fran aren’t so far flung, that they actually share common ground. Hayes makes you remember what it was like to be a kid, reveling in every hopeful notion that you and your crush were destined to be together. Pinch hitting for Chenoweth, Everman was subtly effective as Fran. She showed little stage presence in her first scenes, but seemed to grow more confident throughout the show. The role of Fran is of a hidden broken woman—the pretty girl that seems to have a careless life, never showing the pain on the inside. She is stuck in the no-way-out married man affair and hates herself for it. Everman plays Fran with the occasional flash of self-loathing, like a knife when it catches the light. It’s interesting that Everman was on for Chenoweth when I saw the show, because I don’t see Chenoweth fitting the role of Fran. It’s a job for an understated actress, which Chenoweth isn’t. Act II begins with a where’d-that-come-from shot, which is Katie Finneran. As a boozy barfly, Marge, she is keeping Chuck company at a local pourhouse while he drowns his sorrows over Fran and his boss. She gets 15 to 20 minutes of stage time, and it’s comical how she steals the stage and the audience’s attention away from everybody else. In what could be another tired portrayal of a comically drunk woman, Finneran has ravaged the script, reinventing every facet of each written word and stage direction. Using unexpected inflections and never allowing her face or body to cease acting, Finneran proves brilliantly that no role is a throwaway. The Burt Bacharach, Hal David score sounds well enough, although a little old timey. Producers were smart to include Bacharach/David radio hits “I Say A Little Prayer” and “A House Is Not A Home,” songs that were not in the original production, to draw audiences and provide numbers to anticipate. The set, designed by Scott Pask, is expensive looking and literal (a corporate office lobby, CC’s cozy apartment). A motif of rectangles are used, acting as overlapping frames, but I couldn’t figure out the significance, other than aiming to include some level of abstract design. The costumes, designed by Bruce Pask, are perfect 60s style, and are appealing, considering the current revival of skinny suits, Mad–Men style (oh look, the producers were right – Promises is like Mad Men The Musical!). Like any truly quality show, the costumes and scenery aren’t effective without the honesty of the actors. 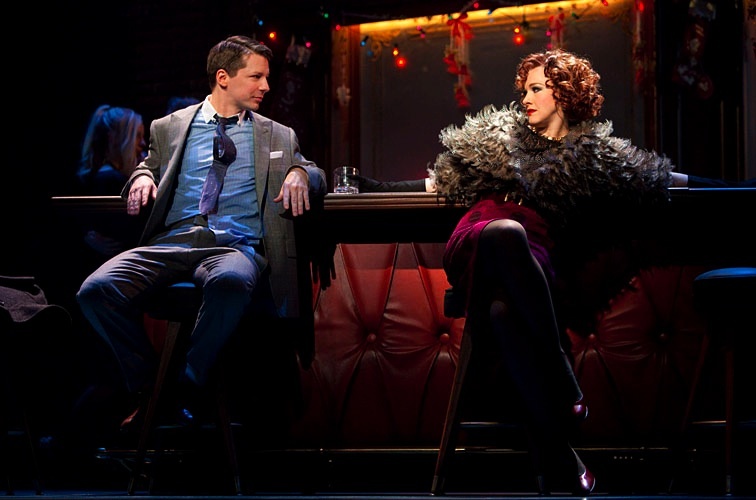 Sean Hayes is a bright light on the stage, bringing humanity and charm to Chuck. He’s a lot more important to the show than Chuck would ever realize. 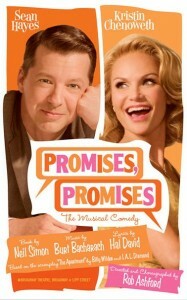 I was invited to see Promises, Promises and did not rush it. The show does have a student rush policy for two tickets per ID, $30 each, and they go on sale when the box office opens. hey jess, love the new look and feel of the site very easy to navigate. Keep up the great work ! !